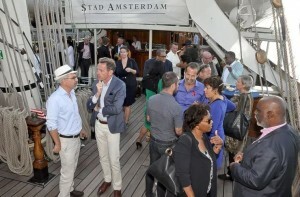 AMSTERDAM - The short documentary “Clipper Stad Amsterdam: Connecting Continents” produced by the WeConnect Foundation was officially presented in Amsterdam on Sunday in front of an appreciative crowd from the Dutch Caribbean and the Netherlands. Central in the close to 30-minute film is the Stad Amsterdam, a three-mast 19th-century clipper inaugurated in 2000, which often sails between Europe, the Caribbean and the United States (US). The film highlighted the shared historical, economic and cultural ties between the Netherlands, the countries of the Kingdom, Cuba and the US. Invited guests were welcomed on board the tall ship for a screening of the film by WeConnect Chairman Paul Comenencia and WeConnect Manager Tanja Fraai. A similar screening already took place in Miami late April this year, hosted by Kingdom of the Netherlands Consul-General in Miami Nathalie Olijslager-Jaarsma. The documentary follows the clipper Stad Amsterdam to St. Maarten, Cuba and Miami. A camera was placed on board of the ship to shoot footage of the voyage. In St. Maarten, local student Valene George, who recently completed her Marketing and Communication studies, interviewed the clipper’s captain Andi Manser. Asked about her contribution following Sunday’s presentation on board of the Stad Amsterdam, George said that it had been an “amazing” experience. George was in St. Maarten to finish her thesis and went on board of the ship after its arrival early January this year. She was one of the several Dutch Caribbean students who assisted in creating the film. “I learned a lot about the ship. Before the interview I didn’t know of the ship’s history. I felt grateful for the opportunity and to be part of history. We shot a lot of good images. It was too bad that the sound failed because of the high winds,” George told The Daily Herald. The sound issue was cleverly solved with a voice-over of narrator Fraai, while the documentary showed beautiful images of the ship sailing into St. Maarten. Captain Manser explained at the start of the presentation that connecting was exactly what the clipper Stad Amsterdam does on its voyages with on board some 100 young people who receive extensive training on the ship. In November the clipper will once again depart for the Caribbean and the US. Fraai noted in her introduction that the documentary was an idea of Consul-General Olijslager-Jaarsma who saw the importance of the ship’s role in connecting the continents. In the documentary, Olijslager-Jaarsma explained the extensive, historic relations between the US and the Netherlands. “With the clipper, we tell the Dutch story, the connection with water, ship-building and the maritime history.” Water, also as a connecting element, is one of the main themes of the documentary. The clipper visited Cuba for the first timethis year; a historical visit that underlined the connections between Cuba and the Dutch Kingdom. “Not only the Netherlands, but also Curaçao, Aruba and St. Maarten show renewed interest in a cooperation with Cuba,” said Dutch Ambassador in Havana Alexandra Valkenburg. The ship’s visit to Cuba coincided with a conference attended by Dutch Minister of Education, Culture and Science Jet Bussemaker, St. Maarten Minister of Education, Culture, Youth and Sport Silveria Jacobs and representatives of the Ministries of Education of Aruba and Curaçao. Bussemaker and Jacobs were interviewed for the documentary. Both underscored the importance of cooperation, while Jacobs mentioned the high level of education in Cuba and expressed the hope that more students from the islands would be able to study in the region. Professor of Caribbean History at the Erasmus University’s School of History, Culture and Communication (ESHCC) in Rotterdam Alex van Stipriaan mentioned in the film the Dutch conquests in the 17th century, but also the (slave) trade and the colonisation of territories in the New World. “The West-India Trade Company WIC and the East-India Trade Company VOC were multinationals that could also wage wars, something unimaginable in modern times,” said Van Stipriaan. Director of the Royal Netherlands Institute of Southeast Asian and Caribbean Studies KITLV Gert Oostindie also mentioned the historic context in his introduction before Sunday’s presentation of the film which will be shown at Dutch embassies throughout the world.